Showman ® Basketweave and leaf tooled leather saddle bag. 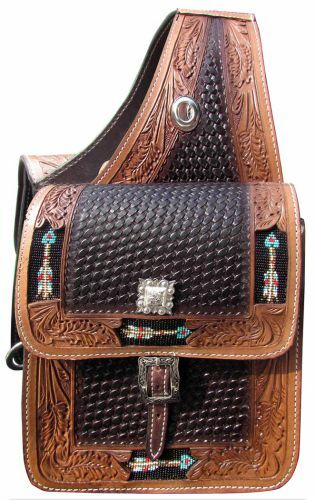 This saddle bag features dark leather basketweave tooled center with medium oil leaf tooled edging. Accented with beaded arrow inlay on edging and features one buckle closure on each side. Comes equipped with front D rings. Bag measures 10" x 10" x 3" with a 4" gusset.